A proactive threat defense is an absolute must in the current cybersecurity landscape. Chief information security officers should put measures in place that can identify suspicious activity and other anomalies in as timely a manner as possible. But when a cybersecurity event is detected, what comes next? Once an enterprise’s CISO and IT stakeholders have an understanding of the key systems in their infrastructure, have worked to protect the delivery of critical services and are able to pinpoint activity related to a cybersecurity event, the next step is to respond to this activity. It’s imperative that this response includes efforts to contain and mitigate the damage, but it’s important to understand that efforts shouldn’t end there. Today, we’re closely examining the Respond function, which includes the processes CISOs and their teams should follow after threat detection. Through the lens of the NIST Framework, the purpose of the Respond function is to establish and put in place the necessary procedures that enable stakeholders “to take action regarding a detected cybersecurity event.” This function builds upon the efforts CISOs and their teams have taken under the Identify, Protect and Detect functions, and encompasses mitigation of the detected threat, as well as other critical steps. 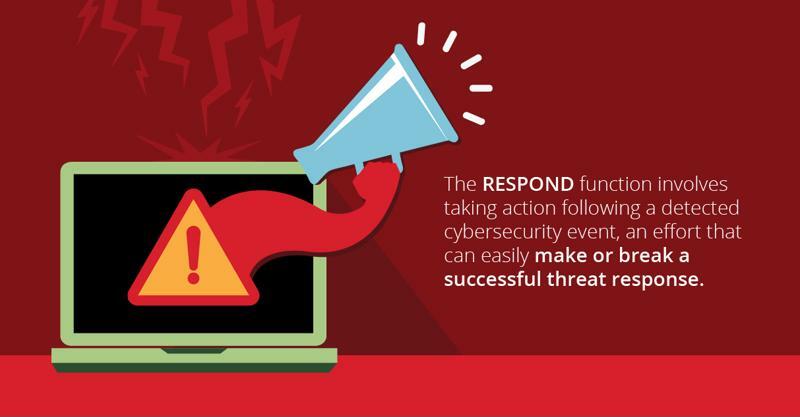 While each part of the framework is critically important, the processes and activities carried out as part of the Respond function can very easily make or break the outcome of a cybersecurity event. Timely detection of the threat is incredibly helpful, but making quick efforts to analyze the issue, contain the damage and carry out response plans can mean the difference between a large scale breach, or unsuccessful intrusion on the part of hackers. To respond to a threat appropriately, there are a few key processes to plan and put in place ahead of time. In this way, the CISO can effectively direct efforts and security teams understand their roles and responsibilities in responding to anomalous network activity while safeguarding the business’s most crucial informational assets and supporting systems. Response planning: Upon the threat being recognized as part of the Detect function, the Respond function begins with the execution of previously created response procedures. These response plans must be carried out in a timely fashion, either while the cybersecurity event is still taking place, or after, depending upon the timeliness of threat detection. Communications: This category will lean heavily upon the CISO and his or her team. Here, internal and external stakeholders – typically lead by the CISO and IT admins – coordinate response activities, and may reach out to law enforcement for support, if needed. During this process, individuals follow response plans and understand their roles therein, the initial threat event and any other associated events are reported on, and this data is shared with stakeholders to ensure coordinated consistency according to response plans. In addition, details about the event can be voluntarily shared with key stakeholders outside the company. Analysis: During this process, CISOs and their teams examine and investigate detection system notifications to analyze the impact of the event, as well as the adequacy of the enterprise’s response. This is also when forensics are performed. Mitigation: This critical step includes processes to contain the incident, prevent it from spreading and mitigate the potential damage of the threat. In addition, any new vulnerabilities not identified in the past are documented and included as part of the company’s overall understanding of risks. Improvements: Finally, CISOs and other stakeholders examine the lessons learned from responding to the threat, and work to incorporate these findings into future response strategies. Similar to the Detect function, timeliness is critical during an organization’s response. Any delay in carrying out response plans and mitigation can create additional opportunities for malicious actors to expand the reach of the threat, and potentially make off with stolen data or interrupt key services. In this way, CISOs must ensure their teams fully understand their roles and responsibilities as part of response plans, and can carry these out in an expert and streamlined manner. Let’s take a look at a real-world threat that underscores the importance of a quick and decisive response. In the current threat landscape, targeted attacks that hone in on a specific victim or industry are becoming increasingly common. As Trend Micro researchers explained, these cybersecurity incidents can be motivated by an array of different factors, but one of the most powerful and popular goals among hackers is information theft. Malicious actors will focus their efforts against a certain business or group in order to make off with highly sensitive and highly valuable data assets, which can range from company intellectual property to customer data and beyond. Once the target organization is breached, hackers move laterally to support data collection and then exfiltrate the data, which can then be used for further malicious activity like fraud, or sold on underground marketplaces. Overall, 25 percent of all data breaches over the last decade were targeted attacks motivated by information theft. Targeted attacks could also be driven by espionage, such as when hackers attack and breach the systems of government organizations, activist or political groups. A prime example of this includes hacking group Pawn Storm (APT28, Fancy Bear), which attacked the systems of victims associated with government, security research and political organizations. Particularly when an organization is targeted by an attack, it’s imperative that CISOs are able to expertly direct response efforts in a way that can help prevent the damages described above. Targeted attacks are typically carried out by motivated hackers seeking out specific results, but by following through with strong response plans and containing the damage, CISOs and their stakeholders can effectively reduce the level of impact their company incurs. The NIST Cybersecurity Framework includes one final function: Recover. After CISOs apply the lessons learned as part of their response efforts and work to improve future procedures, it’s essential that they help the company adequately recover from the attack.